So it’s a surprise then that he’s hit the public speaking circuit big time. 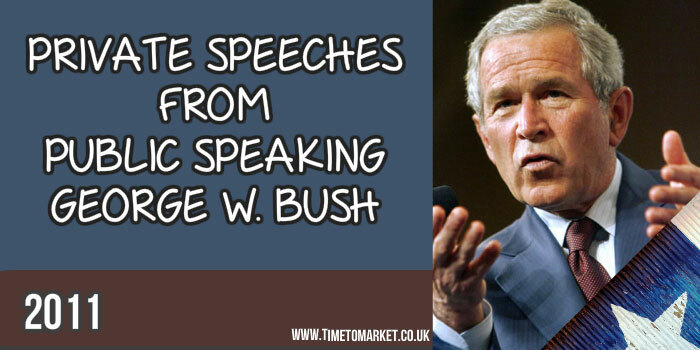 However, his speeches are mainly corporate affairs–like the speech he gave at the Ernst & Young Strategic Growth Forum at the JW Marriott Desert Springs Resort in Palm Desert, California. In November he also spoke at the Wichita, Kansas, Area Chamber of Commerce’s annual meeting. Pre-booked tickets, that had to be verified on the day of the speech, sold for between $25 and $125. The former President’s speaking fee on that occasion was thought to be in excess of $100,000 and possibly as much as $150,000. That’s quite a speaking fee. And it goes some way to explaining how the President has amassed a probable $15 million for the 140 speeches he’s given since leaving the White House. But all this public speaking is done in private. These are closed, ticketed affairs without journalists. On one recent occasion his staff determined that a journalist acting as a “question master” wasn’t appropriate. The journalist missed the event and someone else without a press pass was asked to moderate the question and answer session. These sessions are pretty tame, in that all the questions are screened. Nothing too controversial or awkward. Nothing that might upset the flow. Not that the President would be controversial. He doesn’t get involved in a critique of his successor. Presidents don’t do that. But, we are told that his speeches do give a good account of some of the decisions he had to take in his eight years as President. So, does the President provide a comment on his White House speeches? No, he does not. Private speeches or public speaking, you are very welcome to organise a one-to-one coaching session for all your public speaking needs. So, please do not hesitate to contact us.